Most personal and organizational problems are the result of a little-known problem called "self-deception". We deceive ourselves into thinking we're doing the right thing for the right reason, but people won't follow a leader whose motives are selfish. The tricky thing is, we don't know that our motivation is flawed. Not quite "out of the box"
GREAT book about how to interact with others. 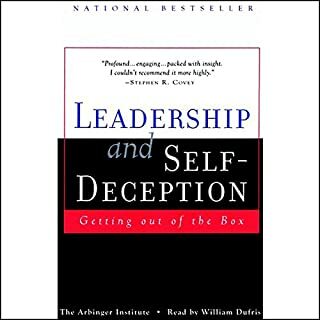 Would you listen to Leadership and Self-Deception again? Why? The material in this book is very thoughtful and enlightening. It needs a re-read and refresher as you try to apply these principles. The effort is worth it, it will have positive and lasting effects on your success. Imagine the chance to sit down with 30 of the world's best-known and best-respected leaders as they share their secrets to success. 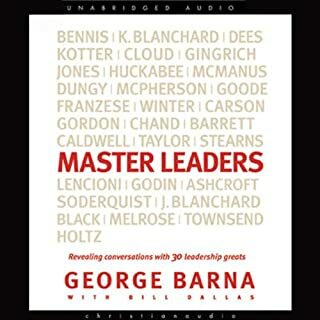 That's Master Leaders - the most valuable leadership book of the decade. I think religion has a place in everyone's life but not in a book that suggests it is about the personal strategies of Master Leaders. The religious references are so frequent and so lengthy, rarely have anything to do with the content. I am happy the author has embraced his religion so firmly but I am sad it derailed the content of this book.